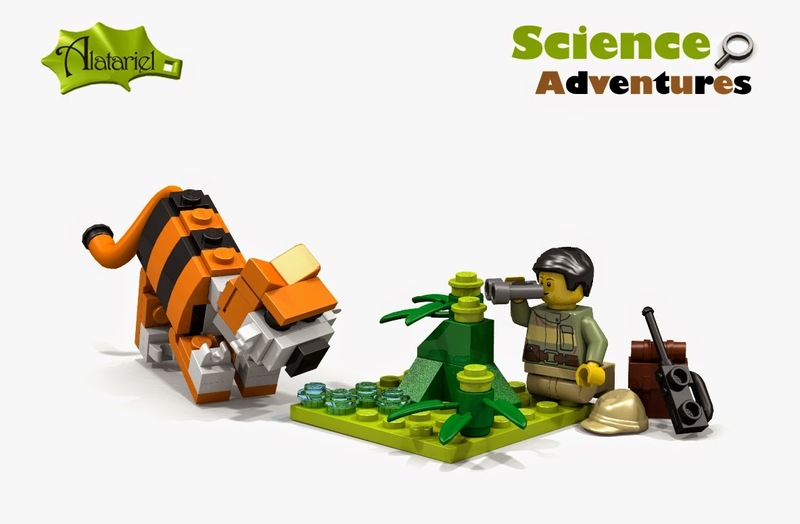 Join the scientist on their research adventures! The geologist explores the mountains to locate important minerals and unravel the processes that have shaped the Earth. The wildlife biologist is on a jungle expedition to study the tiger in its natural habitat. The archaeologist investigates bones and artifacts to uncover the secrets of an ancient civilization. This set consists of three vignettes of scientists in their outdoor work environment. The small settings are built on 6x6 base plates and each scientist comes with a set of tools and equipment required for their research. The accompanying booklet will provide short descriptions of the respective research fields. This set combines an educational aspect with a fun building experience and plenty of play value. The presented set consists of 188 parts. Please support if you would like to see it as a real product! Geologist Dr. Coyman is examining an unusual rock formation. Some work with the rock hammer is needed to find out what is inside! Biologist Dr. Miller is hiding behind a nearby bush when a thirsty Siberian tiger shows up to drink from a puddle of water. A perfect opportunity to study its behavior up-close! Archaeologist Dr. Yates made an extremely interesting historical find of a fully preserved skeleton and real gold coins. Will this provide the final clue in understanding the ways of the ancient people who lived here? I love your tiger, can give me the instructions for build her?